Conducted by Leonard Bopp ’19 the Chamber Orchestra of Williams performs Nico Muhly’s “Drones, Variations, Ornaments,” Serenade for Tenor, Horn, and Strings by Benjamin Britten, and Aaron Copland’s Appalachian Spring. 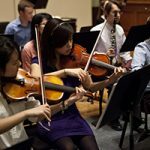 The Chamber Orchestra of Williams is a student-led, flexible-instrumentation ensemble dedicated to innovative programing and engaging performance experiences. Having long operated as a biennial winter study course, the orchestra emerged in 2017 as a fixture on the Williams campus, with regular programming throughout the academic year.